When it comes to our client process, we either have it completely in order or we admittedly wing it a little. Not only will having a streamlined client process free up your time and energy, but it will actually delight people from the moment they reach out to you, right until the end of working with you, and even beyond! 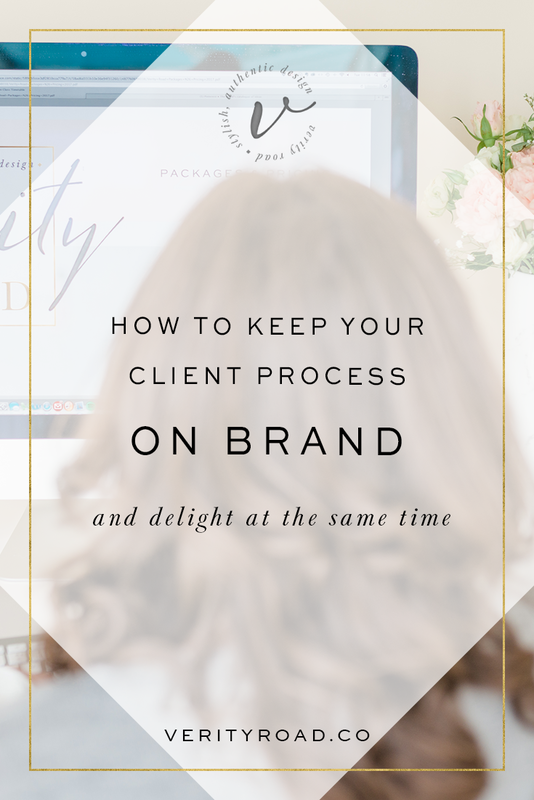 It means you won’t ever send a bad email because you’re having an ‘off day’ or you won’t miss a step and have the client questioning whether you actually have it all together… So how about I share with you two things you can do right now to create an effective client process that also wows and is on-brand?! 1. Create a script database of emails that you can copy, paste and edit: Hey, this doesn’t mean you’re losing the human touch! In fact, it’s the opposite — saving these templates will have you sending emails that are truly caring, empathetic, nurturing, full of correct and necessary information, good spelling/grammar/punctuation and are personalised. Each carefully crafted email will reflect your brand tone, take the same format (who doesn’t like consistency?! ), include your branded signature and demonstrate the professionalism and personality that your brand is about. Defining what your brand culture is beforehand will ensure that your script database stays true to your values. Firstly, look at the emails you’ve sent to a previous client — can you use these to create the basis for your email workflow? Which emails do you find yourself repeatedly sending? Can you now place these into a logical order? You may want to write a breakdown of all of the emails you send, would like to send and also the ones that you’ll use for various scenarios like turning down work, breaking up with clients, how you’ll deal with enquiries for free work etc. Whilst this all seems like a lot of effort now, it will save you a huge amount of time in the future! Once you’ve written these (and proofread! ), head to your Gmail settings >> Labs >> Canned Responses >> Enable. When you click ‘Compose Message’, in the bottom right-hand corner, click the down arrow icon then select Canned Responses >> New Canned Response. Here you’ll be able to save each of your email templates ready for the next time you need to send them! Having this in place allows you to keep your client conversation to the minimum it needs to be… nobody likes to be in their inbox 24/7! Both you and the client will receive the information needed to kick off and maintain a great working relationship, plus you’ll never forget to include their name and a little reminder asking if there’s anything else you can do to help. The little touches that keep your emails personable are really key — look back at the culture you defined for your brand earlier and ask yourself if each email is demonstrating that. 2. Sign up for a business management tool like 17Hats: An app like this allows you to manage every part of your client process in all one place – your to-do list, your calendar, your contacts, your quotes, your invoices, your agreements, your projects, your leads, your emails and so much more! It also offers the ability to track the time you spend on a project, set up workflows so your process is automated, save all of the templates you created above, do your bookkeeping, store documents, record phone logs, add related contacts, set budgets and so on. Your clients can accept a quote, sign a contract and pay an invoice all from within 17Hats. Having everything in 17Hats (or a tool like it) will transform your business — it boosts client confidence by not having to manage multiple tools to complete their actions, plus you always know where you’re at, allowing you to deliver an exceptional experience from acquisition to retention. There are lots of features that allow you to stay on-brand both in identity and tone… customise your invoice appearance, add your email signature, upload your logo and choose a branded promo/referral code! Want more posts about branding?